Utilising a Viking 2tonne hammer attachment mounted on Komatsu tracked base machine, FK Lowry has recently completed a complete precast foundation package in a new housing development in Belfast. 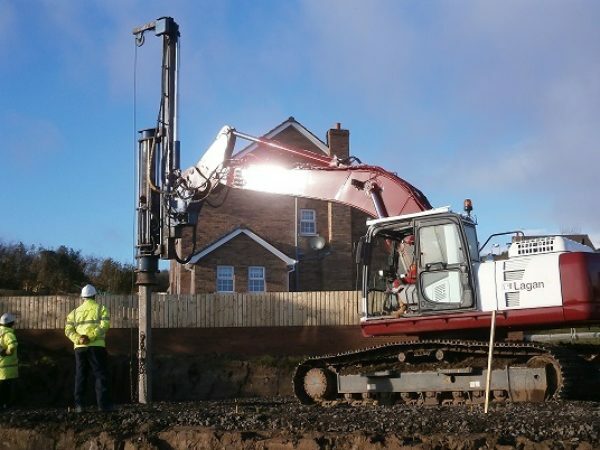 Toland House properties required a complete foundation and precast subfloor system to be installed for a total of 9 new houses due to poor ground conditions. FK Lowry Piling utilised their Pond Park facilities and In House capability to complete the works. Close liaison with the Client & Architects was required along with technical advice throughout to insure that our package conformed to stringent NHBC and local building control requirements. After a successful Phase 1, FK Lowry Piling has been awarded Phase 2 commencing March 2013.